As The Church of the Holy Trinity in Vicksburg nears its 150th anniversary, parishioners are already celebrating with a cookbook commemorating church history, the beauty of its stained-glass windows, memories and, of course, food. This Episcopal church was founded in 1869, six years after the Siege of Vicksburg. Among the 26 memorial windows is the Reconciliation Memorial, installed in 1880. Comprising five windows of German glass, it is believed to be the first public memorial in the South intended to foster reconciliation after the Civil War. “The Trinity Cookbook” features color photographs of all the windows, along with histories of the parish and the construction of the Romanesque Revival church building and 190-foot tower, a historic Vicksburg landmark. 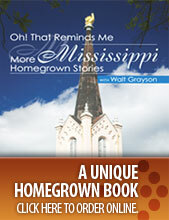 The cookbook offers traditional southern comfort foods favored by generations of parishioners, but also recipes inspired by modern tastes and other cultures. We picked a few summertime dishes to share with you here, but this cookbook is rich in heartier fare—the casseroles, entrees, soups, stews and desserts we crave when the temperatures drop. 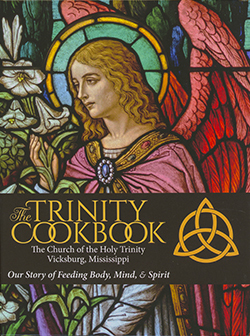 “The Trinity Cookbook” may be ordered from The Church of the Holy Trinity, 900 South St., Vicksburg, MS 39180, or TrinityCookbook.com. Price is $29.95, plus $5 shipping for one copy, $2 each additional copy. A portion of the proceeds will go to the United Way.